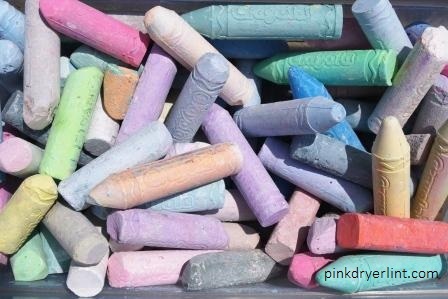 Recently, I shared how I discovered the mother of all containers of sidewalk chalk while cleaning my garage, which means that we'll have chalk in stock until the end of June. At any rate, the only second grade classroom jobs that I remember deal with chalk: erasing the chalkboard, washing the chalkboard with sponges and a bucket of water from the lavatory (which is a term that's significantly more sophisticated and mature than bathroom), and clapping the erasers, which had been my favorite job by a long shot. Even as an adult, I find myself oddly drawn to chalk. For example, I once brainstormed other occupations that I could see myself doing besides writing and teaching college students. Among them: professional closet organizer, namer of paint or nail polish colors, and person who transcribes the daily specials on the chalkboard in restaurants. See? Chalk not only permeates the landscape of my childhood memories, but also appears in my career aspirations. At the moment, chalk also happens to be all over my sidewalk, front porch, and one window screen where my three-year-old seemed to be attempting to grate her piece of sidewalk chalk to nonexistence before I noticed and intervened. 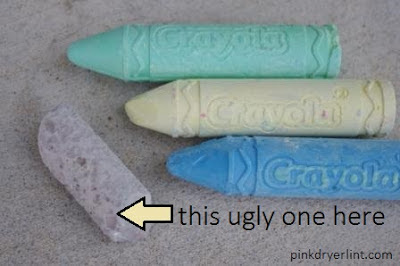 Of course, when dealing with sidewalk chalk, there always seems to be one piece that gets the shaft. It's the piece that, if named, would be called "muted mud" or "bleh brown." Becase it blends in with the sidewalk, this color of chalk is most likely to be left out in the rain. 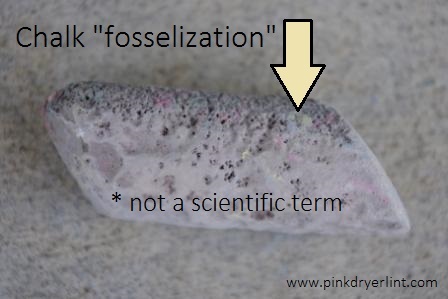 This results in what I like to call "chalk fosselization," a harmless dappling effect that not only creates hundreds of miniscual craters in the chalk's exterior, but also increases the likelihood that this piece of chalk will never, ever be selected or used by a child -- and that at the end of summer, you'll have a small stockpile of it. 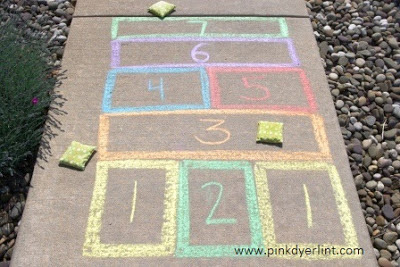 Any given day, how many pieces of chalk will roll down your driveway? Well, this depends on how many pieces of chalk you're using. If you're using 11, then 11. If 7, then 7. I'm proposing that there's a 100% chance of rolling, unless your driveway is flat, which is ideal, or you use the square chalk, which is brilliant. What is the number of rainbows (or trucks or farms or butterflies) your children will coax you into drawing by the end of summer? Precisely 117, which is about 112 more of said object than you intended to draw. When tracing a chalk outline of a child, is it ever possible keep their head, hands, and feet in proportion with the rest of their child-sized bodies? No. No, it is not. Don't even try. In fact, expect that the outline will resemble a club-footed alien when your child stands up. Will your child attempt to eat a piece of chalk when no one is looking? Yes. Unless he or she attempts to eat a piece while people are looking. You know, just to be showey. What fun things can do with chalk, besides the obvious of actually chalking? Well, hop scotch happens to be a family favorite. Making a bean bag toss where each block counts for a certain number of points is another winner. If you're a bit obsessive-compulsive (I know nothing of this, of course), then you can organize your chalk according to color. Fun with sorting, and all that. What's your most memorable chalk moment or fun chalk activities? Or, for the sake of conversation, what was your favorite elementary school classroom job? Clapping the erasers was empowering, wasn't it? * Admit it. You tried to say chalk in stock, didn't you? 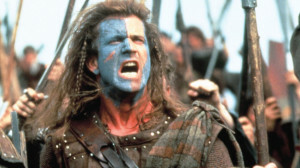 Bravehart picture from Testosterhome blog. Looking for a humorous and uplifting read for the summer? Check out Then I Became a Mother. Available in both Kindle and paperback editions! We make "stories" where 1 person draws something & the next person adds to it & it continues on. With my kids it usually ends in something "exploding" or "burned by dragon fire" where they gleefully scribble the entire picture out of existence. i just wanted to pop in and say that you are a breath of fresh air. I've been looking at many mommy blogs lately and was pleasantly surprised when I found yours. Your site is well organized and not too "busy". You write clearly and grammatically correct. I love the way you say things. Love your pictures. i will have to look up how to get my own blog name on my pictures, too. I keep seeing that. <3 Your newest follower. Adding your blog's name to your pictures is simple. I open a new version of the picture in Paint, and then use the text feature to type on the URL. That's such a picture of vibrancy -- and also what looks like intense concentration! This idea is brilliant, Kitty! Love it! I loved this. Such a fun, whimsical post. A fact about me... I love chalk but can't stand the feeling of it on my hands. I like to wear a lightweight glove when drawing with it... weird, I know. I too, LOVE the square chalk. It is brilliant.